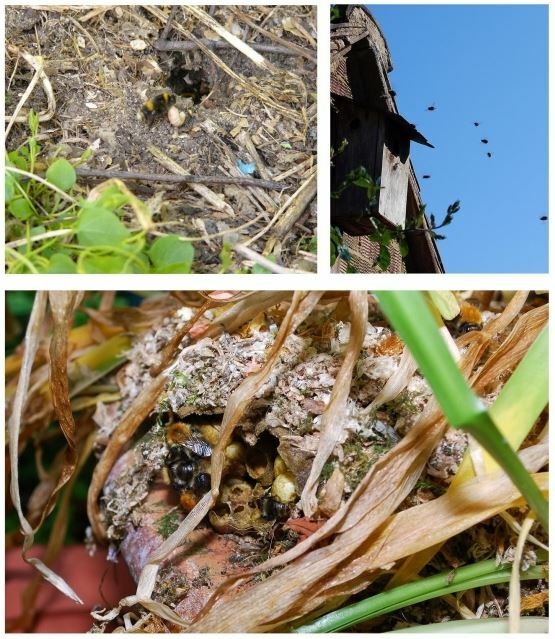 Every year we receive hundreds of enquiries relating to bumblebee nests so, in addition to our main webpage about bumblebee nests, we have prepared this list of frequently asked questions to help answer our most common nest enquiries. We have also created this guide to bumblebee nests and what you need to know to help people understand what to do if they find a nest. What kind of bumblebees are they? You can use our identification guide to try and have a go at identifying the bumblebees in your nest. If you manage to take any photographs you could also have them verified by an expert by uploading them to BeeWatch. For guidance on how to take a good photo for identification purposes click here. How can I help a bumblebee nest? You can help a bumblebee colony which is nesting near you by providing plenty of bee-friendly flowers for them throughout their life-cycle. We have this advice on gardening for bees, and also our BeeKind tool which helps you score your current garden and receive plant recommendations. How long do bumblebee nests live for? Normally nests live for about 2 or 3 months. After this time the original queen, her workers and her sons will die. If the nest has been successful in rearing new queens they will leave the nest to mate and then go on to hibernate somewhere in the soil – ready to emerge the following spring to start their own colonies. Will the bees damage my house? Bumblebees do not cause structural damage (i.e. they do not chew through wood or bore holes). They utilise material which is already available to make their nests, some like Buff-tailed bumblebees (Bombus terrestris) will use old mice nests, while Tree bumblebees (B. hypnorum) have been known to make nests in fibreglass loft insulation or in used bird boxes. Bumblebees don’t store up massive amounts of honey like honeybees either – so you won’t have any honey oozing through your ceiling or walls. There are lots of bees swarming outside the nest, what should I do? Bumblebees do not swarm. Some species like Tree bumblebees (Bombus hypnorum) have distinct mating behaviour in which male bumblebees from all around will seek out a nest and fly around outside. They dance around in the hope that they will get a chance to mate with a new queen as she leaves the nest. It is a bit like the equivalent to a bumblebee nightclub! On hot days there can be well over 50 male Tree bees dancing around outside a nest which can look a little intimidating, however male bumblebees cannot sting and there is no need for concern. This usually signifies that the colony is coming to the end of its life-cycle and that it has been successful in rearing new queens which will go on to mother the next generation the following spring. If you see a swarm of honeybees you will need to contact your local beekeeping association swarm collector. Honeybee swarms contain hundreds (sometimes thousands) of honeybees which will usually be huddled together on a tree or some other surface. There are lots of bumblebees outside my window and I can’t open it without them coming in, what can I do? This is likely to be Tree bumblebee males (see question above). If you do find bumblebees in your house, it is always best to catch them gently and let them outside again. If there is a nest right above or outside your window, you can cover the opening with netting to prevent bees from entering when you have it open. I have a nest in my garden and I’m worried about my pets or children? Bumblebees are not aggressive insects and are generally only interested in finding flowers. The only time when they may act defensively is if something disturbs their nest so it can be a good idea to put some sort of barrier in place a few metres from where they are nesting so that any pets or young children do not disturb the nest. Having a bumblebee nest in your garden can provide a great opportunity to teach children about these vitally important pollinators. We have lots of resources available to help. Can someone move the nest for me? Please note: we do not move bumblebee nests. Generally we do not advise that people move nests unless it is absolutely necessary. Most bumblebee colonies do not survive after being relocated so it is always better to let them finish their short life-cycles rather than move their nest. If the entrance to a nest is in an awkward place – such as next to a door, you can attempt to re-route the exit – Please see our advice on how to do this here. How far should a nest be moved? Generally we would advise moving a nest either a few feet or somewhere which is noticeably different so that the bees will re-orientate themselves as they leave the nest following the move. Bumblebees generally forage no more than 1km from the nest so moving them over 1km away will also have the same effect. One thing which can be useful if only moving the bees a short distance is an obvious landmark. For example positioning a large plant in a pot outside the nest for a few days prior to moving and then moving the plant pot to the new nesting site prior to their release. *Note – We often find that male Tree bumblebees don’t always recognise a nest has moved and will continue to compete for space outside the old nest – they eventually disperse after a few days though. I have bumblebees nesting in my cavity wall somewhere, what should I do? Nests in cavity walls are extremely difficult to locate, so it is best to allow them to finish their life which will only last for a couple of months. In the autumn after you stop noticing bees coming and going from the entrance, you can close up any holes which they were using. It’s important not to do this while the nest is still alive as the bees will become trapped or end up using a different exit which might lead to them coming inside the house. If the bees were using an air-vent it is important not to block this up, you can position some mesh over the vent after the nest has died to prevent future queens from starting their colonies in the same place.